In the beginning were people with a common bond of faith. In 1944, a small group of 150 Catholic families from Wood Dale, Itasca, and surrounding communities began a mission church in Wood Dale. They celebrated their first Mass on March 26 at the Wood Dale Public School. Father Niess, then pastor of St. Alexis, Bensenville, officiated. The old St. Vincent Ferrer Church building located in River Forest was purchased. The building, an organ, and a Communion rail cost $400. All were moved to our present site on July 6, 1945. It took almost two years to complete the church because materials and contractors were hard to get during World War II. Father Joseph E. Wagner was appointed our first pastor in autumn of 1946 by Cardinal Samuel Stritch, Archbishop of Chicago. Father Wagner said the first Mass in the church basement on November 1, 1946. The Cardinal dedicated the Church of the Holy Ghost on June 1, 1947. In September of 1948, Holy Ghost School had a humble beginning with only ninety- six pupils and three classrooms in the church basement. A four-room school building was erected in 1949 under the leadership of the School Sisters of St. Francis. That same year Holy Ghost Church became a part of the newly established Diocese of Joliet. Pope Pius XII appointed Most Rev. Martin D. McNamara as the first bishop of this diocese. Father William D. Ryan became the second pastor of Holy Ghost on June 14, 1961. Under his guidance and through the efforts of the people of Holy Ghost, we continued to grow physically and spiritually. It soon became necessary to plan larger facilities. A building fund drive was underway by 1975. Father Ryan helped to raise the funds and supervised the building of our current church building, parish center, and offices. Most Rev. Romeo R. Blanchette gave his approval to begin work on a new church building in autumn of 1978. Work began in May of 1979. The dedication by Most Rev. Joseph L. Imesch was March 23, 1980. In June of 1980, Father Thomas J. White became pastor. During his nine-year tenure, Holy Ghost grew and prospered. His welcoming style encouraged the people to become involved and participate in parish activities. Father White was followed by Father Thomas J. Fleming who became pastor in 1989, leaving after three years for health reasons. Father Kevin Farrell, came in June of 1992. Since coming to the Church of the Holy Ghost, he has up-dated our liturgical celebrations and initiated a Stewardship Program emphasizing time, talent, and treasure to serve God. Father Kevin supports us with thoughtful, timely, and on-target homilies. He continues to provide sensitive spiritual guidance and practical learning opportunities for his flock. We are in great debt to Father Kevin for his 23 years of service to Holy Ghost. We will miss him when he retires in June of 2015. One cannot enter the church without passing through the narthex in which the Baptismal Font and garden reside. The entrance into the font is designed on a North-South (or death) access. The candidate sits down into the water and is plunged 3 times under the waters of new life. The immersed candidate now becomes the newly baptized, and while standing in the font is turned and reoriented to the East-West (life access). The baptized is now a full member of the Church and emerges to face the sanctuary where the altar-table, cross, & ambo (the podium where the Word of God is proclaimed) is located. This is an intentional statement so that the font leads the baptized to the altar. The paschal candle is placed prominently near the font symbolizing the reality that Jesus is our light throughout our faith journey. The oils of the sick, chrism, and catechumen are also located in an ambry within the font area. Ancient cultural understandings and experiences were drawn together by the early Church to express its understanding of Baptism. The earliest traditions had Christian Baptism celebrated at the great Easter vigil. The Elect (the candidates) were led down into the font and immersed in the waters of Baptism. They were then led from the font, clothed in white garments to signify new life in Jesus, anointed with oil to signify God’s selection of them as His own and then presented to the assembly for the first time to join in the Eucharistic meal. These early Christian Baptism traditions were restored after the Second Vatican Council and they are also reflected in the architectural design of the font. Baptism reflects ancient cultural understandings and experiences drawn together by the early Church. The writings of Paul draw upon two cultural bathing traditions to explain the meaning of baptism. The first was the Roman tradition of social baths in which community was fostered, the second was the Jewish ritual baths performed with the religious intention of cleansing believers from sin. The two traditions had common elements: a bath or washing in water, the putting on of new or freshly laundered clothes and an anointing or perfuming with scented oil. Both involved a community aspect. The Roman baths were social experiences that fostered the community. 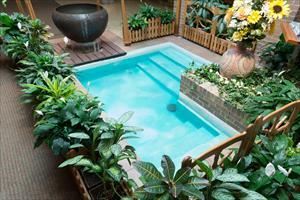 The Jewish ritual baths restored the wholeness of the community before God. These are the same essential elements used in the current Rite of Baptism. In the Jewish ritual bath, the vessel containing the water had to be large enough to immerse an adult. Also, the water had to be “fresh,” that is flowing water. Flowing water was known as “living water” because the Hebrew people believed that flowing water was moved by God’s Spirit. Our font is intentionally designed to be large enough for both infant and adult immersion. The water in the font constantly moves and overflows with the “Living Waters” of Jesus. God’s gift of new life through baptism is ever visible and within touch to all who pass through the font area in the parish narthex. Many other wonderful changes have been made in our worship space across the past few years. The skylight over the altar brings a new radiance into the sanctuary befitting the reality of what transpires there during the celebration of every Mass. Our tabernacle is located adjacent to the sanctuary and mimics in style and shape, the cross that is suspended just beneath the skylight. The tabernacle placement affords new opportunities for adoration to the Blessed Sacrament. A spacious sacristy just off the narthex is a bright, highly functional room which gives our clergy and acolytes a place to prepare for liturgies. It provides suitable storage space for vestments and sacred vessels. The music choral area has three graduated levels of plat forming, padded chairs for the choir members, and a very functional redesigned area for musical equipment and the parish instrumentalists. Overall, the sanctuary furnishings with their harmony of design and simplicity of beauty can’t help but identify our church as sacred space. The ambo (pulpit, lectern) is slightly raised and positioned to complement the altar. It is a worthy place for where the sacred Word is proclaimed. The altar, tabernacle, sanctuary lamp, cross and processional cross also echo these unifying qualities making the entire church Nave a beautiful environment for giving praise and thanks to our God. St. Peter, St. Mary Magdalen, St. Maximillian Kolbe, St. Augustine and St. Monica, St. Kateri Tekakwitha, Pope John Paul II, St. Joseph, Mother Teresa, St. Anne and St. Joachim encircle the assembly. The saints in our church depict a variety of traditional and modern day saints which serve as a support and reminder to all who worship in our space that we are all called to be a holy people. The saints represent Christians of various ages, professions, life styles, genders, and time periods. The John Paul II window is one of the first stained glass representations in the world of our Pope since his passing. The windows were designed and fabricated by Light Haus, Inc., in Madison, Wisconsin by Don Pellett. The painted black on white glass Stations of the Cross in a triptych form are located on the back walls of our space. Jesus’ journey from death to new life is depicted in scenes placed within a cross. The scenes are unique in that they require the human eye to complete the scene of each station. The stations are set in mahogany and iron hinged in three piece frames which open for the Lenten Season and close during the rest of the liturgical year. When closed, a combination of mirror and baffled glass which mimics the pattern in our stained glass windows adorns the front panel. The stations were designed by artist David Wilson of South New Berlin, New York, and Rick Findora of Morning Glory Studio in Lodi, Wisconsin. Our cross is a magnificent rendering of Jesus in transition from Death to Resurrection. It is made of mahogany, lead, and glass. Jesus is suspended in front of the cross and hangs in mid-air as if ascending into the arms of His Father. The cross was designed by Rick Findora of Morning Glory Studio in Lodi, Wisconsin, and the artist that sculpted the corpus was Jay Hall Carpenter of Gaithersburg, Maryland. A shrine honoring Our Lady is in a cove-like area for special devotion to Our Blessed Mother. Sculptors of the statue, Anna Koh and Jeffrey Varilla of the Koh-Varilla Guild, located in Chicago, Illinois created Annunciation, our beautiful kneeling Mary Statue. Ted Okreglak, a master woodworker, designed the mahogany shrine for the Mary sculpture, along with the ambry ( oils cabinet). The book is located in the narthex of our church. It is a gold covered engraved book which honors all of the past and present benefactors that make the mission and most recent renovations of our parish possible. The book is located under the stained glass Holy Spirit logo in a niche just outside the sacristy. Our parish history includes the keeping of a record book with a listing of all the deceased members of our parish community. The list of names of all the deceased are recorded into our “Book of Remembrance” which is prominently displayed amongst the foliage and living waters in our baptistry area. The Farrell Faith Formation Center is located at the northwest entrance of the Church near the portico, and was dedicated on May 15, 2009. It is a tribute to Fr. 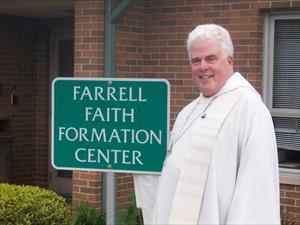 Kevin Farrell for his lifelong commitment and dedication to education and faith formation. The center fulfills a personal goal Fr. Kevin had throughout his priesthood- to have a center for ongoing faith formation for all ages within his parish. Our current Director of Parish Faith Formation, Sheri Abel, Ph.D., runs the center and is charged with providing formative educational opportunities for all parishioners. Fr. Farrell's legacy of lifelong faith development will be remembered every time a child, teen, young adult, adult or senior takes part in parish formation offerings. The Emmaus Room, located on the north end of the narthex, is an adult prayer, meditation, adoration, spiritual counseling, and formation space managed and maintained by the parish Faith Formation Director. It was dedicated on Oct. 28, 2011 by Fr. Kevin Farrell. The warm neutral tones of the furnishings and works of art provide a quiet, prayerful and reflective space for adults. The renovation and décor was made possible through the generosity of parish donors. The space continues to be maintained by and through the generosity of parishioners. Donations and memorials to honor loved ones are always welcome. Posted on either side of the doorway is a calendar of events and the donors’ plaque. 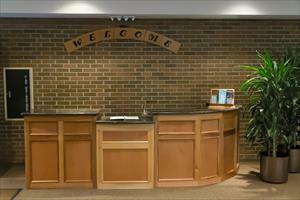 In order to be more inviting and hospitable to those who come to worship each weekend, Holy Ghost Parish added a “Welcome Center” in our narthex during November of 2014. Parishioners had the opportunity to make a Christmas gift to the parish in memory of a loved one by making a donation for the Welcome Center. This structure respects the beauty of our worship space. Ted Okgrelak, who made the “home” for our Mary statue and the “garden” around our font, has built this small but quality structure to match the mahogany wood that was used for other furnishings in our narthex and church. Having a Welcome Center opens up the opportunity for a new ministry at our parish. Welcome Center Ministers come 15 minutes early to the mass of their choice to be scheduled monthly to stand at the welcoming center and answer questions or give out requested forms or envelopes. One person is scheduled before each Mass and one person after Mass for each week of the month. 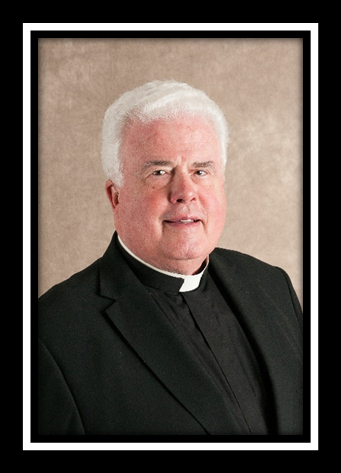 Father Kevin R. Farrell, our retired pastor, came in June of 1992. He has up-dated our liturgical celebrations and initiated a Stewardship Program emphasizing time, talent, and treasure. Father Kevin supported us with thoughtful, timely, and on-target homilies. He provided sensitive spiritual guidance and practical learning opportunities for his flock. We are in great debt to Father Kevin for his 23 years of service to Holy Ghost. We will miss him and hope he comes back to visit us often. I truly believe that this is happening now and will be the case with Holy Ghost Parish and with me. I have so enjoyed the years that God, in His graciousness, has given me to be with you. Thank you for being the Lord’s good instrument in calling forth from me even better service to/for you. I ask for your forgiveness when I was not able to meet your needs. Closing this door in our lives, may you and I look forward to the new doors that He will open for us. I know that you will welcome Father John with open minds, hearts and arms. Please keep me in your prayers, as I promise to keep you in mine. On the weekend of June 13-14, Fr. Kevin celebrated his 50th anniversary in the priesthood with this Faith Community of Holy Ghost, for which he has served as Pastor for 23 years. Members of his family, friends and special guests – like members of the Addison Police Department, for which he has been a chaplain for more than 40 years, and members of the Coast Guard Auxiliary, with whom he has served for over 25 years – also joined our Holy Ghost community over that weekend to celebrate this milestone in Fr. Kevin’s life. We celebrated Fr. Kevin’s retirement/anniversary at all three of our weekend liturgies, after which everyone had the opportunity to congratulate and visit with Fr. Kevin in Ryan Hall. Appetizers and wine were served after the 5 p.m. Mass on Saturday, and with a full breakfast served after both the 8:30 and 10:30 a.m. Masses on Sunday. These celebrations were provided with the generosity of the Council of Catholic Women, Knights of Columbus, and Boy Scout Troop 65! We are all most grateful for their efforts to make this time memorable for Fr. Kevin, as well as the many of us who have been blessed to call him our pastor, our friend, our colleague, our family. We wish him God’s richest blessings as he embarks on a new chapter in his life – retirement! Click here to see photos from Father Kevin's Farewell Celebrations take by Dave Schmidgall. The password is Kevin (case sensitive).